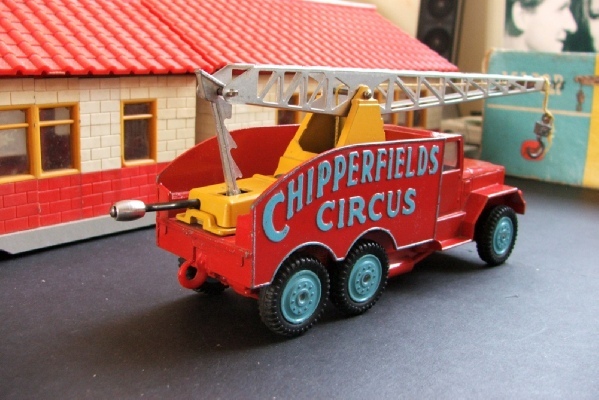 Here’s an early Six Wheel Crane from the South Derbyshire Circus Collection. It is in super condition and the silver metal jib can be positioned on the rachet device at the back and the hook lifted or dropped using the handle. The handle does look a bit odd but it works nicely still after all these years! This has been carefully looked after by a long-term collector of these items and is in very good condition indeed with hardly a mark noticeable and with excellent wheels and tyres. It has an original box of the older ‘lift off’ variety. This type of box is so much more sturdy than later ones and it has survived well. It has wear on the edges and corners but is generally good and has good shape.